A central vacuum cleaner allows you to have the freedom to vacuum anywhere in your home without carrying around a cumbersome unit. A principal concern when designing a central vacuum system is avoiding situations likely to cause clogging of the tubing with debris such as toothpicks, hairpins, needles, or similar-shaped objects. The most important safeguard is at the vacuum inlets, which are intentionally designed with a tighter radius of curvature than any other bends in the system. This is done to ensure that if any vacuumed debris becomes stuck, it will jam right at the inlet, where it is easiest to discover and to remove. Well-designed central vacuum tubing rarely or never clogs unless severely abused (e.g. vacuuming wet plaster, wet flour, or other sticky substances). The wall inlets are connected to the power unit by tubes that can be run inside walls, or through vertical pipe chases, closets, the attic, basement, or the cold air return ducts (if permitted by building code). In new construction, the vacuum tubing is usually installed during a "rough-in" phase once the building interior framing is complete, after other in-wall utilities (e.g. plumbing, HVAC, electrical, etc. ), and just before drywall, paneling, or other surface finishes are installed. Strictly speaking, vacuum tubing should probably be installed before cabling, since routing of wiring is usually less constrained than tubing. In a similar manner to plumbing and electrical fixtures, the vacuum inlet fittings and final connections are installed in a finish phase, after the wall finishing is complete. 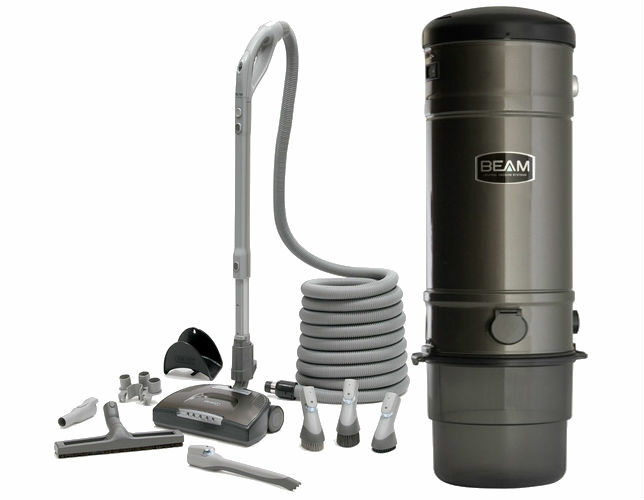 Central vacuum systems require periodic emptying of the dirt canister or replacing the filter bag, typically 2–4 times per year. In some models, it is also important that the filters be changed frequently, especially for designs where the just-filtered air passes through the motor for cooling. For filtered systems, the bag may need to be replaced long before it is filled to its nominal capacity, because of reduced suction due to clogging with dirt or fine dust. Filterless cyclonic separation systems only require emptying the dirt collection container before the suction drops off as an almost-full condition is reached. Many cyclonic vacuum systems now feature translucent dirt collection canisters, allowing quick inspection without removing the canister. Regardless of which dirt separation system is used, the electric motor may require lubrication of its bearings, or replacement of carbon brushes on an infrequent basis, usually measured in years. Rarely, a central vacuum system may become clogged, especially if the tubing was poorly installed, or if the system is abused by vacuuming sticky substances (such as paint or glue or wet foodstuffs). As a homeowner just give us a call so we can come down and locate the blockage and remove it for you.